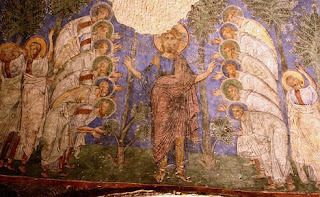 On the left is a Byzantine fresco from Cappadocia, in modern day Turkey, of Christ sending the twelve Apostles (ca 12th century). In the Nicene Creed we say we believe in the one, holy, Catholic and apostolic Church. The Church is apostolic because Christ founded it on the Twelve Apostles. Apostoloi is a Greek word meaning “those who have been sent’. The Apostles were chosen and sent forth by Christ himself. In today’s Gospel he gives them special instructions for a specific mission. He calls them to be detached from worldly things by telling them not to bring a second tunic. However, he tells them to graciously accept hospitality when offered. He works miracles through them so that both they and the people to whom they are sent will know that they have power from God. It is not the Apostles who chose Jesus, but he who called them (cf. John 15,16). In our first reading Amos is annoying wealthy and powerful people in Israel with his prophesying. Unlike other prophets who belonged to a guild and chose it as a career, Amos was a simple shepherd and dresser of sycamores when God called him to prophesy. He challenged Israel to moral reform and was hated for it. The guild prophets preferred no to rock the boat. They lived a comfortable life serving the King and avoided controversy. Amos prophesied against the King of Israel at a time of unprecedented prosperity. He warns that God will punish Israel if she doesn’t mend her ways. Amaziah, a priest loyal to Jeroboam, accuses Amos of stirring up trouble and plotting against the King. He commands him to stop prophesying and to leave Israel. Like in the times of Amos, today many want the Church to be silent about moral issues. They try to push Christians out of the public square. They unfairly accuse us of imposing our morality on people. They falsely accuse us of trying to establish a theocracy. But the Church can never be silent in the face of injustice and attacks on human life and the family. The Church maintains her right to speak on political matters, since her right and duty to speak about faith and morality often intersect with politics. Jesus chooses twelve apostles, because twelve is symbolic of the twelve tribes of Israel who derive from the twelve sons of Jacob who is also called Israel. We read "Do not neglect the gift you have, which was conferred on you through the prophetic word with the imposition of hands of the presbyterate." Men were chosen to physically represent himself as the Bridegroom, not because Christ viewed women to be inferior. Every human being has equal dignity, although we are called to exercise different roles. The priesthood is not a path to power, but a call to self-emptying. Today the Pope and the Bishops in communion with him are the successors of the Apostles. Episkopos is a Greek word for bishop. It literally means overseer. The Bishops choose priests to represent them and help them to carry out their role as overseers. In The Acts of the Apostles, St. Paul summons the presbyters of the Church in Ephesus. Presbyter was used to distinguish the priesthood of the New Covenant from the Jewish priesthood. At his episcopal ordination, each Bishop received the fundamental mission of authoritatively proclaiming the word of God. 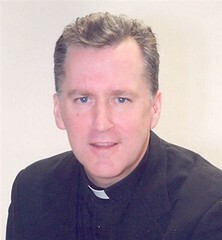 Indeed, every Bishop, by virtue of sacred ordination, is an authentic teacher who preaches to the people entrusted to his care the faith to be believed and to be put into practice in the moral life. This means that Bishops are endowed with the authority of Christ himself, and for this fundamental reason when they ''teach in communion with the Roman Pontiff they are to be revered by all as witnesses of divine and catholic truth; the faithful, for their part, are obliged to submit to their Bishop's decision, made in the name of Christ, in matters of faith and morals, and to adhere to it with a religious assent of the mind''. In this service of the truth, every Bishop is placed before the community, inasmuch as he is for the community, which is the object of his proper pastoral concern and for which he insistently lifts up his prayer to God. Pope Benedict XVI has dedicated this year to be Year For Priests to emphasize the importance of priestly ministry. We must pray as Christ taught us that he would send us more shepherds to guide us and provide us with the sacraments (cf. Mat. 9, 38). The priesthood is not a career. It is a vocation. Pray for those who have been called by God that they will be faithful to their high vocation. Pray also for the wisdom and humility to accept the teaching of these shepherds as the teaching of Christ and to listen to the prophets in our time who call us to repent of our sins and believe in the Gospel. Very full and enriching, we need more apostles as fr. to help and guide us on our journeys.